Important information about selecting the proper grinding wheel for your application. See Speed Chart below the article for a quick comparison and available models. 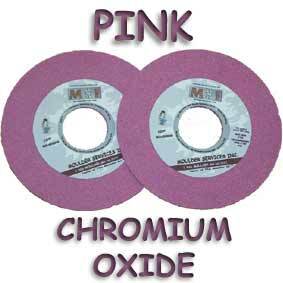 The selection of the proper grinding wheel is as important as the selection of the knife steel. When grinding steel knives, which range from HCHC, AKM to M2 to EHG, Opti-knife and DGK the variety of grinding wheels available can be mind boggling. In simple terms, the harder the knife steel, the softer the grinding wheel must be. The softer the knife steel, the harder the grinding wheel must be. To make a particular grinding wheel act harder, speed up the rpm of the machine. To make a wheel act softer, slow the machine down. 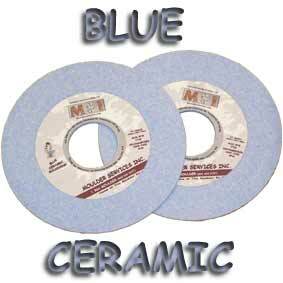 Grinding wheels are available from a white vitrified Aluminum Oxide (ALO2) to Ceramic then into the Superabrasives. Most operations work with the vitrified style wheels. They are less costly and do a great job on most steels. The white ALO2 wheels grind fast but normally do not hold their shape very well. The introduction of the blue or red grain into the white ALO2 creates a wheel that grinds fast but one that will hold its shape much better. The final result is either a light blue or a pink wheel. It should be noted that color of the wheel does not indicate its quality. The use of the newest type of low cost wheel, the ceramic wheel has allowed tool makers to grind cooler, faster and with less grinding wheel breakdown. 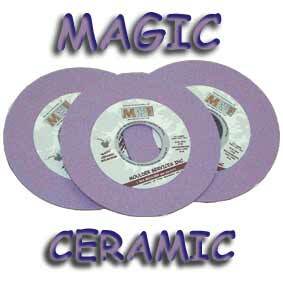 Ceramic wheels, like all grinding wheels, range in quality . Only the finest wheels available are offered here. Consistency of the wheel is a must in order to grind in a high class tool room. The newest MSI Magic Ceramic wheel has proven to grind a variety of tool steel s quickly and with little or no burning. In order for a wheel to achieve maximum results, it must grind cool and fast. It also is necessary to reference the grinding wheel to the tool rest the same each and every time. This is what will give you the accuracy from knife to knife in the cutter head body. Many grindermen use both roughing and finishing wheels. If this is your method, be sure to reference both wheels the same to the tool rest. If you primarily use only a roughing wheel, then to produce detail on the tool you can lower the back angle by 3 degrees, speed up the wheel and apply wax into the wheel. This will cause the wheel to buff the knife instead of grinding the knife and the finish quality will be superior. Never exceed the maximum operating speed of the wheel. Use the correct coolant mixed to the proper ratio. Check the ratio using a refractometer. This hand held device will assure you that the coolant is not to lean, causing rust, or not to rich, causing health risks. When dressing a wheel smaller than 3mm or 1/8” you must use a finish wheel of not rougher than 100 grit. A rougher wheel than this will not hold up well and will generally break due to the size of the grain. Click Here to Return to the MSI Grinding Wheel Product Page.